The Mongol hordes didn’t materialise, as things turned out. Indeed, anyone looking for trouble around Brighton railway station yesterday lunchtime will only have found a handful of bored and cold looking policemen and the pubs humming with travelling support from Manchester enjoying a pre-match drink and trying to postpone having to venture out into the bitter, lacerating cold. The short hop train journey to Preston Park is followed by a brief walk in the woods before arriving at Withdean Stadium. Contrary to the apocalyptic predictions of a few, there isn’t a great deal more security here today than there would be on a normal Saturday afternoon, though and the atmosphere is blessedly cordial. Withdean is one short step for FC United on a journey that has already seen them beat Radcliffe Borough, Gainsborough Trinity, Norton & Stockton Ancients, Barrow and Rochdale. Many of those that haven’t been able to secure tickets for the match are watching anyway, from a vantage point overlooking Withdean that makes much of the pitch visible and on television screens in London and at the Flixton Cricket Club, just outside Manchester. The club brings with it an undeniable and unsupressible sense of event to the match, and even prior to kick-off all of the noise inside the ground comes from the away end, to our left. 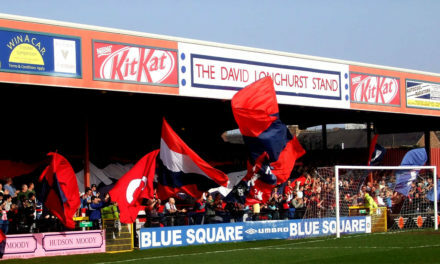 The myth that it is impossible to create an atmosphere at this ground is being demolished before our very eyes – they just have to work harder for it on account of the distance that they are from the pitch. In spite of the distance between the two sides in the league, there remains a suspicion in the air that that this is not a bad time to be playing Brighton & Hove Albion. Excluding the penalty shoot-out against Woking, they haven’t managed a win in their last five matches and their confidence is somewhat brittle. What had been an eight point lead at the top of League One has been whittled down to four points and this match is a distraction that they can probably do without. Seven of their players this afternoon didn’t start their goalless draw at Southampton on Tuesday night, and Gus Poyet is taking a bit of a gamble with his selection. A defeat this afternoon is, for them, unthinkable, but they did come closer to this than they would be comfortable with against Woking. It is no great surprise that Brighton spend vast periods of the first half encamped in the FC United half, yet a sign of what is to come is already present in the sheer, bloody-minded obstinacy of the visiting goalkeeper Sam Ashton, who makes a good early save from Ashley Barnes, followed by another from Cristian Baz. The best of the lot in a busy half sees him scramble across the goal to save at point blank range from Barnes. With five minutes to play of the half, however, Brighton are sit by the sucker punch to end all sucker punches. Carlos Roca’s ball from the right hand side is touched back by Michael Norton and Nicky Platt, who scored the opening goal at Spotland in the previous round, fires a diagonal daisy-cutter through a gap and into the bottom corner of the net. Amazingly, impossibly, the shock is back on again. Half-time brings Brighton an opportunity to ruminate upon the missed chances. What has been noticeable has been the extent to which the FC United has been troubled by the crossed ball, and in the early in the second half the ball is pushed wide more and more frequently in an attempt to break through and haul themselves back into the game. Brighton are already encamped in the FC United half with an equaliser taking on a feel of inevitability about it, and then with twenty minutes to play their job is made much easier when FC United defender Scott McManus is sent off for an off the ball assault upon Brighton’s Gary Hart. It’s a moment of rare petulance and it looks likely to prove expensive. They have been creaking under the pressure applied by Brighton with eleven players on the pitch, after all. Still, though, Brighton labour and with seven minutes left to play they finally haul themselves level. FC United have been pegged back by this time more or less to within their own penalty area, and Mauricio Tarrico’s header across the face of the goal is touched over the line by Francisco Sandaza to bring them level. Within minutes, Sandaza has a second chance from point blank range but Karl Munroe turns the ball over the crossbar with his head. A draw, a replay at Gigg Lane and a place in the Third Round of the FA Cup seem on the cards, but second half delays mean that there it feels like no great surprise when six minutes of injury time are added to the end of the match. Six minutes into stoppage time, the entire tie is reduced to one kick. Brighton, still seemingly keen to avoid the distraction of a replay, have continued to push on in the hope of a win and with time now having run out Sandaza breaks free in the penalty area before being bundled over by Munroe. It’s a clumsy tackle, a desperate tackle and a tired tackle, and it gives Brighton one shot to nudge their way through to the next round of the competition. Elliott Bennett steps up, shoots to his left and… Ashton throws himself across and pushes the ball behind for a corner. It’s a magnificent save, one that is absolutely worthy of winning this match, and seconds later the final whistle blows. This extraordinary story has another chapter to run yet. Away to our left, a party has already started that doesn’t seem likely to end any time soon. The decision to label this match as a Category C match, the first at Withdean for five years, was an extraordinarily wrong-headed one and the proof of this has come with the impeccable behaviour of the travelling FC United support. The most surprising thing about all of this is that anybody was surprised by this in the first place. Withdean has not – if ever – witnessed anything like this in years and they, as well as their team, thoroughly deserve their place in the draw for the Third Round of the competition. A draw that might have felt like a defeat after Brighton’s late equalizer was flipped on its head in injury time and, with Ashton’s moment of brilliance, feels like a win again. On top of this, those that weren’t in the 895 that managed to secure tickets for this match can now look forward to a chance to get behind the team in the replay. Sunday evening brings the draw for the Third Round of the competition and the winners of this match will play last year’s runners-up, Portsmouth at home in January – just as many in the mainstream media called it wrong in stating that AFC Wimbledon would want to play against Milton Keynes after the draw for the Second Round, those eyeing up a match between FC United and Manchester United have misjudged the club’s support. Brighton, meanwhile, have an unwanted dilemma – do they field a weakened team for a replay that comes a few days before a critical top of the table match against Huddersfield Town? Many Brighton supporters may now be of the opinion that, after three straight draws against non-league opposition in the FA Cup this season, a lesson about fielding under-strength teams in the competition should have been learnt by now. Meanwhile, another victory has already been won by FC United of Manchester this weekend. If the battle for hearts and minds counts for anything, the noise and colour of the supporters has rolled into another town and out again without incident, and the possibility of the replay being televised may bring further, much-needed money into the club. On top of the decision that was made on Thursday to grant planning permisssion for their new ground, they have had a brilliant few days and the positive attention that their cup run is bringing them is thoroughly deserved. This alternative vision for the future of football continues to confound and amaze. Nice report Ian, especially for those of us pre-occupied by predictable events at Kingsmeadow. A cracking read as always Ian. I was at the match as well, and found it hard to concentrate on the events on the pitch, given the fantastic scenes occurring off it in the away end. 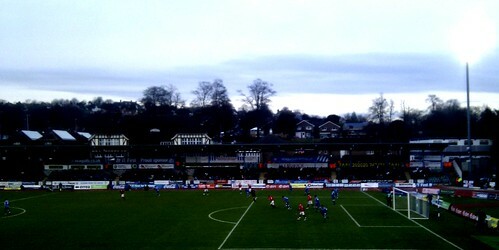 One drawback of watching FC United is that their songs remain in your head for the following week. I was so impressed by them, that I’ve booked up to see a home game (v FC Halifax) on December 11. December 11th? It’ll be off. Toying with going to the replay. 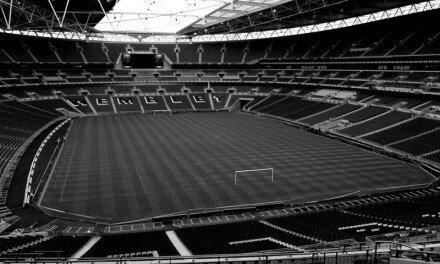 Defo at Ashton match though, even though it’ll most likely be moved or off.